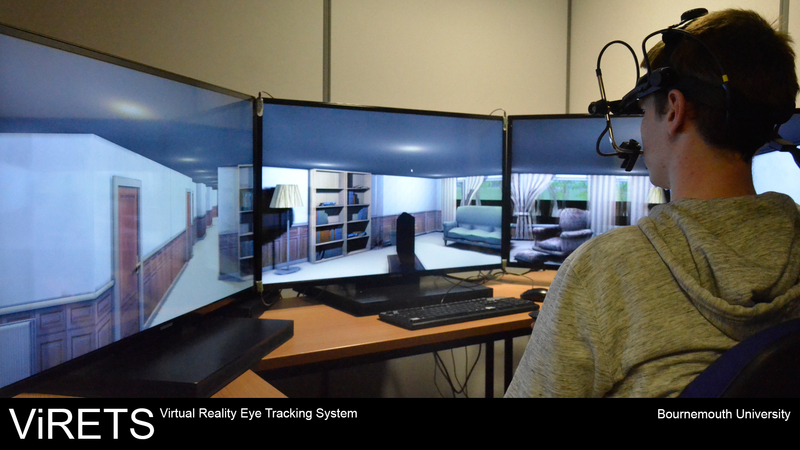 ViRETS (Virtual Reality Eye Tracking System) is Bournemouth University’s highly immersive virtual reality, eye and motion-tracking research platform. We combine a head mounted eye tracker (Eye Link II, SR Research), motion tracker (FASTRAK motion tracker, Polhemus) and a virtual reality engine (Vizard 5, WorldViz) to build realistic applications for research. We currently track participant’s gaze behaviour during experiments on a single screen, with a “3D Eye-tracking solution” currently being undertaken. Gaze patterns can be overlaid on to visual stimuli and replayed. The playback feature has the ability to playback gaze patterns on top of dynamic or static scenes. Fixations on named objects within a virtual scene can be reported in real time or during playback analysis of gaze patterns. This is particularly useful for calculating fixations on certain objects whilst a participant is moving within a virtual scene. Simple methods of converting experiment XML data in to a format which can be easily analysed using traditional tools such as SPSS. The system will combine the head mounted eye tracker and a motion tracker to calculate gaze behaviour within a 3D environment. Using the eye tracker to give us the angle of the eye, relative to the head and the motion tracker to give us the position and rotation of the head, relative to the 3D space, we are able to calculate a virtual line from each eye in the direction a person is looking. Using positional data that is known about any visual plane or area of interest, we are able to report when a person’s gaze intersects with a point of interest. Using our method, we will be able to track user’s gaze within 3D. The first task will be to track gaze over three screens arranged to provide a near 180° field of view but this system should be flexible enough to provide many different eye-tracking solutions such as tracking gaze behaviour within a VR-cave or on a projection screen.